How many billboards are there in L.A. City Council District 11, which stretches from the Santa Monica Mountains to LAX, and from the 405 freeway to the ocean? Nobody knows. How many of those billboards are legal? Nobody knows. But that’s going to change soon, because on a sweltering Saturday volunteers fanned out through the district, driving and walking commercial streets to catalog every single off-site advertising sign in the district. 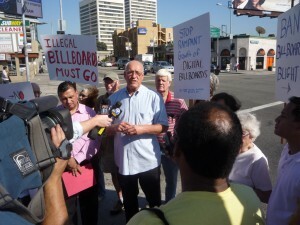 Organized by the Coalition to Ban Billboard Blight, and given full support by CD11 Councilman Bill Rosendahl, the data from the survey will be cataloged and submitted to the Department of Building and Safety, which will send out inspectors to check obvious code violations, and begin the process of checking permits to find billboards that were illegally erected or modified. The building department, which has taken heat recently over its failure to get a city-wide billboard inventory and inspection program going, provided a form for the volunteer survey and sent two officials to explain the fine points of filling it out. In the afternoon, Rosendahl held a news conference at the intersection of Santa Monica and Sawtelle Blvds., which features no fewer than six billboards, one of them recently converted to digital. 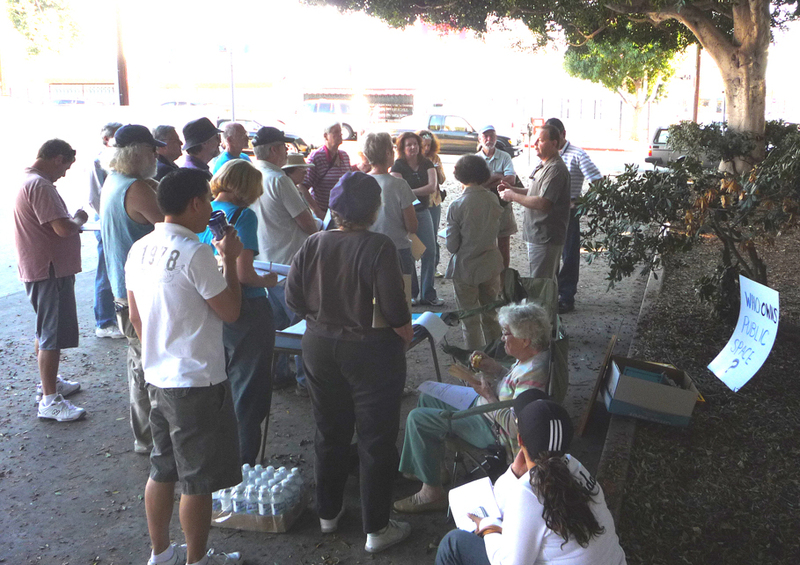 Joined by some of the volunteer billboard surveyors, he promised that he would keep up the pressure to get rid of illegal billboards, and work to stop the spread of digital billboard conversions that have been spreading like wildfire throughout the west side of the city.